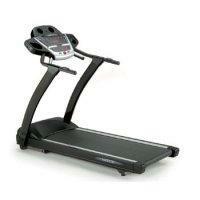 Visit the discount treadmills section and take advantage of treadmill sales and special offers. Planning to get the most value for your money ? Check the best rated treadmills and choose from the hottest treadmills on the market. Compare over 70 treadmills using our unique treadmill comparisons chart. Unsure of what to look for in a treadmill ? Our tips for buying a treadmill will stir you in the right direction. F63 is an entry level model for Sole foldable treadmills. It has a strong motor and the treadbelt is long enough for running, besides walking and jogging. You can compare it to Smooth 5.25 and have your pick between two of them because there aren't enough treadmills who can compete with the level of quality and warranty at this price level. User friendly console showing speed, incline, time, distance, calories, pulse and pace as well as 1/4 mile track and peak and valley graph for different programs. Deck cushioning designed to offer stability while providing minimal stress to hips, knees ankles and spine. You can fold your treadmill when you're not using it to save some space. 8 built-in workout programs for a varied workout. Hand pulse grips together with a wireless chest strap for advanced heart rate monitoring. Speed and incline controls located in the hand rails. Integrated cooling fans for a more enjoyable workout. Do you have any experiences with Sole F63 or any other treadmill ? Help your fellow exercisers by writing a short review about your machine.